DarthLGCV had the most liked content! 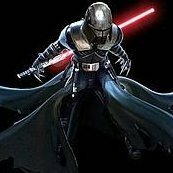 Hi I'm Luis C, SL-18500 from the Carolina Garrison / Garrison Tyranus. I'm Darth Revan and I'm currently working on a Madalorian costume. Being part of the 501st Legion is a dream come truth, I have always been a Star Wars fan and collector sine a young age, can't never get enough! I love being active, going on troops and involving myself on wherever I can to help the garrison take a step forward!